Sometimes nothing but a cupcake will do. There is something appealing about a pretty little cake that is just for you. With large cakes you feel almost obligated to share because they are big and meant for sharing. Let’s be honest, who wants to be the person who ate the whole cake? And what about AFTER you eat the whole cake? Anyone? But, a cupcake can be greedily devoured in its entirety with no guilt or remorse all by yourself. Heck, eat two! Who would mind? So, when I want to be greedy without looking like total dessert deviant I turn to cupcakes. 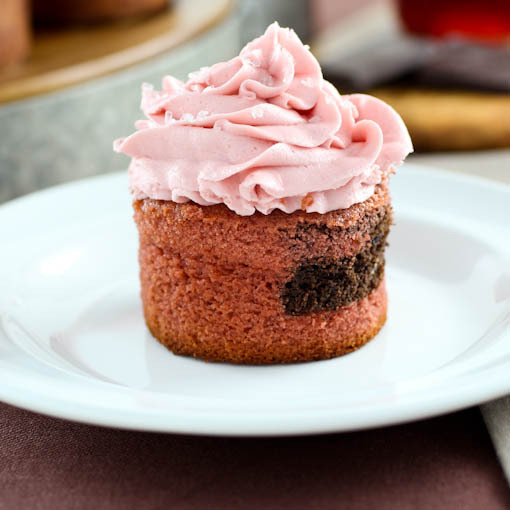 Pomegranate and chocolate intertwine to form a perfectly marbled cupcake which is topped with tangy-sweet pomegranate buttercream. To get the most pomegranate flavor possible I took pomegranate juice and simmered it down into a thick syrup. It adds a bold, mouth puckering flavor that pairs well with the rich chocolate. I did add a few drops of red food coloring to both the cake batter and the frosting to enhance the rosy color of the pomegranate. It is, of course, optional but I liked the deeper pink tones for a more festive flourish. 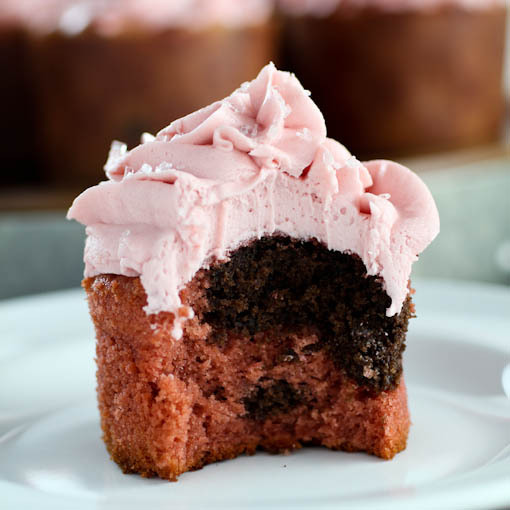 If you wanted you could layer the batter into the liners rather than swirl it, and it would bake into undulating ribbons of pink and brown. I garnished my cupcakes with coarse sugar, but grated chocolate or chocolate sprinkles would also be a nice way to finish these. 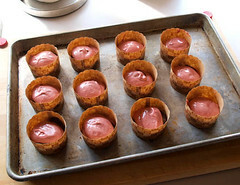 Heat the oven to 350 F and line a 12 cup cupcake pan with paper liners. Alternately you can use 12 paper baking molds. 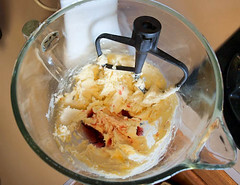 In the work bowl of a stand mixer fitted with the paddle attachment, or in a large bowl with a hand mixer, combine the butter, coconut oil, and sugar. 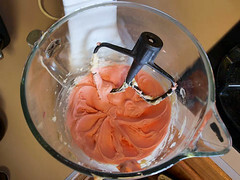 Beat on low speed to combine, about 30 seconds, then increase the speed to medium and beat until lighter in color and fluffy, about 1 minute. 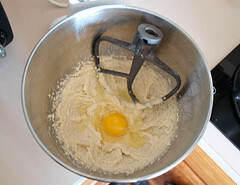 Add the eggs, one at a time, and the egg yolk, beating well after each addition, about 30 seconds. Add the vanilla and stir to combine. 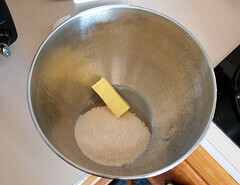 In a separate bowl sift together the flour. baking powder, baking soda, and salt. 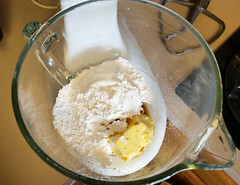 Add the flour mixture alternately with the buttermilk in three additions, starting and ending with the flour. Do not over-mix. Divine the batter in half. 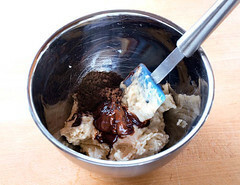 In one half add the pomegranate syrup as well as a drop or two of red food coloring, if desired, and mix until thoroughly combined, about 20 seconds.In the other half add the cocoa powder and melted chocolate and mix until all the chocolate is combined and no streaks of vanilla remain, about 30 seconds. 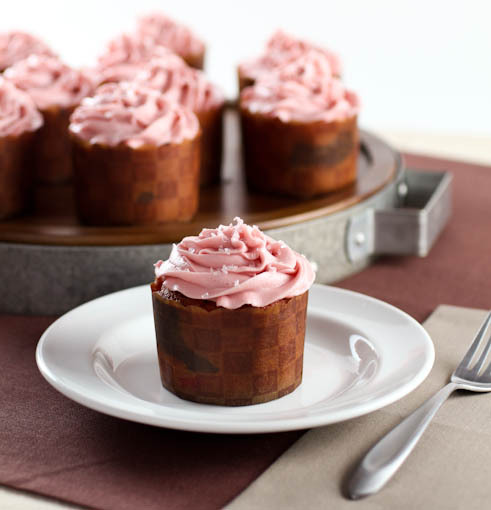 Divide the batters evenly among the cupcake liners, alternately scooping the pomegranate and chocolate batters a tablespoon at a time into each cup. Using a small disher makes this job easier. 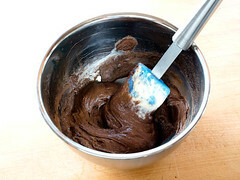 Bake the cupcakes for 16 to 18 minutes, or until the cakes spring back when gently pressed int he center. Cool in the pan for 3 minutes then remove to a wire rack to cool completely. 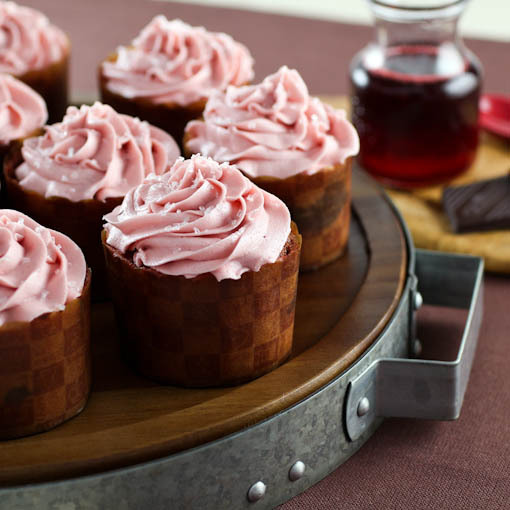 If you are using paper baking molds you can cool the cupcakes on the pan. 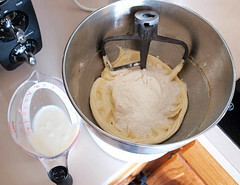 In the work bowl of a stand mixer fitted with the paddle attachment, or in a medium bowl with a handmixer, combine the butter and powdered sugar. Mix on low speed until the mixture is smooth. Add the pomegranate syrup, vanilla, and red food coloring if you are using it and mix on medium speed until well combined and fluffy. 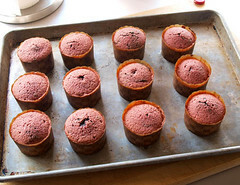 Once the cupcakes are cool pipe or spread the frosting on each cupcake as desired. *To make pomegranate syrup simmer 2 cups pomegranate juice for 25 to 30 minutes, or until reduced down to a little over ½ cup of liquid. Cool completely before using.